Frisco once again paves the way in the modern era of sports. This time it’s the path leading up to the October 2018 opening of the National Soccer Hall of Fame. The 2018 inductees weren’t given word of their status via a typical phone call as in years past. Each of the five inductees were surprised on the same day, in five different cities across the country by current Hall of Famers who either played, worked with or currently work with the inductee. This wasn’t about just a day to notify the special honorees. It was about a new era for the National Soccer Hall of Fame that starts right now… in Frisco. We wanted to ignite the conversation surrounding the National Soccer Hall of Fame. The surprise announcements owned the day, and in the days after there was good healthy sports debate over the class and future classes. In 2013, FC Dallas owners Clark and Dan Hunt initiated a campaign to bring the Soccer Hall of Fame to Frisco. Their late father, Lamar Hunt, brought professional soccer to the United States and built a strong legacy for both soccer and football in this country. In addition to being the founder of the American Football League and the Kansas City Chiefs, Hunt formed the Dallas Tornado and North American Soccer League. He was inducted into the National Soccer Hall of Fame in 1982. In 1996, the Hunt family became a charter investor in Major League Soccer, and two years later Lamar Hunt received the Hall of Fame’s Medal of Honor, an honor of which only three individuals have received. The inaugural Frisco inductees include three players and two builders of the beautiful game. The National Soccer Hall of Fame voting committee determined the 2018 class from a list of 32 finalists. The Class of 2018 will be enshrined during Induction Weekend held Oct. 20 at the brand-new National Soccer Hall of Fame located at Toyota Stadium in Frisco. On May 31, each of the inductees received the good news from a Hall of Fame member close to them. The idea to orchestrate these surprises stemmed partly from the Pro Football Hall of Fame, combined with the intent to engage the soccer community across the country. The day kicked off in Manhattan with MLS Senior Vice President of Competition and Player Relations Jeff Agoos (Class of ’09) surprising Don Garber during a MLS staff meeting with a commemorative scarf and coin that each of the recipients received throughout the day. FC Dallas Chairman and CEO Clark Hunt made a special appearance via teleconference. Garber told Hunt during their conversation how moving it will be to be in a place that the Hunt family has built and that has his dad’s statue outside. In Foxborough, Mass., Brad Friedel’s former U.S. MNT teammate Tab Ramos (Class of ’05) surprised him at the conclusion of a morning training session. 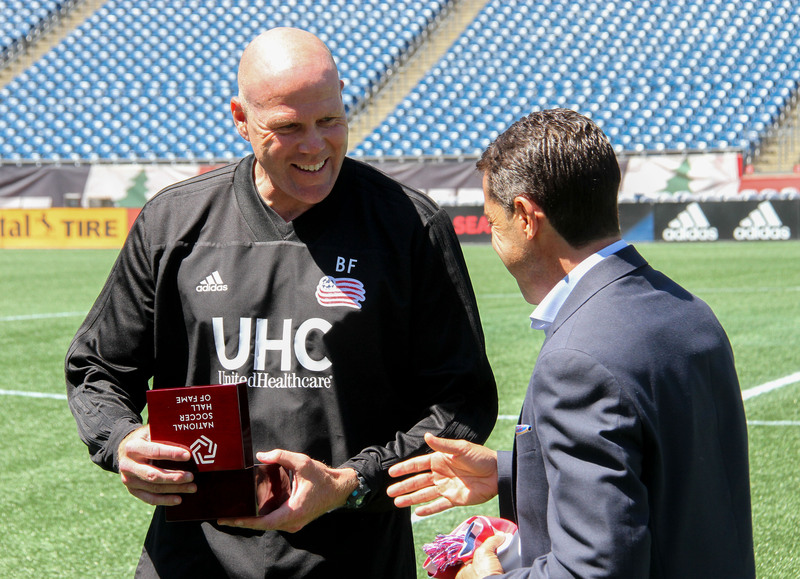 Friedel is the head coach of the New England Revolution, whose team President Brian Bilello, General Manager Mike Burns and Investor/Operator Jonathan Kraft were also on hand for the surprise. I was extremely surprised! I had no idea. I mean the people that have come before me and allowed me this opportunity, not just to be in the Hall of Fame but throughout my entire life. I just turned 40 and I’ve been in this sport since I was three. It’s such a huge honor to be mentioned in the same breath as some of these people. I am so pleased she gets to represent Portland and she gets to represent women’s soccer as an inductee into the National Soccer Hall of Fame. This is another chance for soccer to shine. During a National Soccer Hall of Fame technology meeting in Manassas, Virginia, former U.S. Soccer Secretary General Hank Steinbrecher (Class of ’05) informed Dr. Contiguglia of his honor. A group of representatives from the Hall of Fame marveled at an interactive monitor that will soon showcase the names and biographies of every National Soccer Hall of Famer in Frisco. When Dr. Contiguglia’s image appeared, it symbolized his rightful place among the honorees. Frisco is home to the first major league sports hall of fame to be built within a stadium – The National Soccer Hall of Fame. A partnership among FC Dallas, the City of Frisco, Frisco Independent School District and U.S. Soccer Federation, the Hall of Fame is located in the south end of Toyota Stadium and is made up of two parts – the Experience and the Club. The NSHOF Experience, a 19,350-square foot space, honors the past, present and future of soccer. The Club portion is made up of 3,200 lower level seats and 250 upper-level seats, more than 14,000 square feet of event spaces and a Press Conference room. You can create your own starting eleven, see soccer players from your hometown and be a part of a truly customized experience. It’s a frictionless, easy-to-access bespoke experience that’s never been done before. The 2018 Induction ceremony on October 20 is part of the Opening Weekend of the National Soccer Hall of Fame, where Toyota Stadium and its partners will continue to raise the bar and elevate the fan experience in Frisco.